Comet Hale-Bopp -- Still Enormous! 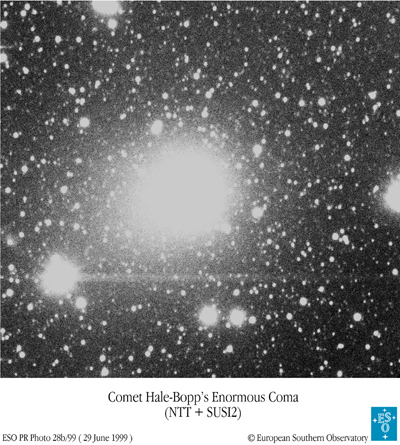 Caption to ESO PR Photo 28a/99: False-colour composite photo of Comet Hale-Bopp, obtained on June 18, 1999, with the SUSI2 instrument at the ESO 3.5-m New Technology Telescope (NTT) at La Silla. Three exposures were made through V- (green-yellow; 60 sec; here colour-coded as "blue"), R- (red; 30 sec; "green") and I (infrared, 30s; "red"), respectively. The sky field measures about 7.2 x 7.2 arcmin2 (2048x2048 pixels). The pixel size is 0.21/arcsec. North is up and East is left. The comet moved just over 1 arcsec during this series of exposures. The bright star in the lower left quadrant is unsually red. The broad line extending to the right from this star is an optical reflection in the telescope. 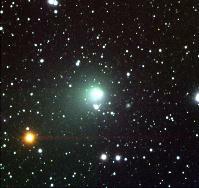 A distant galaxy is seen to the right below the centre (at 4 o'clock) of the comet. One of the most famous comets is Hale-Bopp that passed near the Earth just over two years ago. It now moves out through the solar system, getting fainter with increasing distance. The estimated magnitude is now about 12.5 (visual), i.e. about 400 times fainter than what can be perceived with the unaided eye. Many observations of this object have been made with ESO telescopes during the past years. 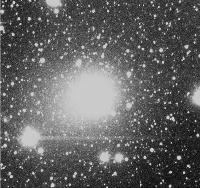 In August 1998, Methanol and Hydrogen Cyanide were detected in Hale-Bopp at record distance, cf. ESO PR 10/98. The emissions from these molecules are now too faint to be measured, but other observations continue. 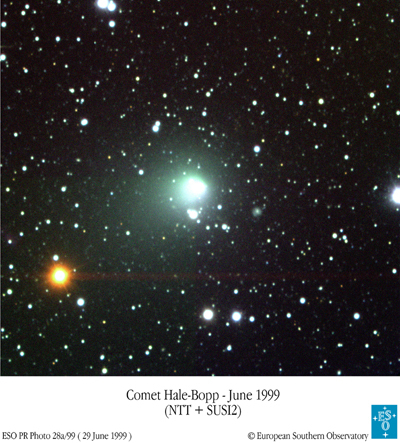 The most recent image of Comet Hale-Bopp was obtained at ESO on June 18, 1999, with the SUSI2 instrument at the ESO 3.5-m New Technology Telescope (NTT) at La Silla. This observation was somewhat difficult, as the comet was very low in the sky at the beginning of the twilight. At that time, Comet Hale-Bopp was located in the southern constellation Dorado (The Goldfish). It was about 1295 million km (8.66 AU) distant from both the Earth and the Sun, i.e. at about as far away as planet Saturn. The new NTT exposures have been combined to a (false) colour picture (PR Photo 28a/99). It shows that there was still a substantial cloud of dust -- a "coma" -- around the comet's icy nucleus, even at this very large distance. Caption to ESO PR Photo 28b/99: This photo is a "sum" of the three exposures that served as the basis for the colour image. It has been contrast-enhanced to show the truly enormous size of the comet's coma, over 3 arcmin across. The optical reflection from the bright star to the lower left was also enhanced by this process. Photo 28b/99 demonstrates the unusually large size of this coma. At the distance of the comet, the part that is visible in this photo is no less than 1.1 million km across, or nearly 10 times larger than Saturn! No other comets have ever been found to have such a large coma at this large distance . There is now little structure in the coma and no "jets" are seen any more. Much of this coma consists of dust that was ejected from the nucleus when it was closer to the Sun. However, it is likely that dust is still lost from the nucleus into the coma, perhaps as a result of a continuing outflow of certain gases (in particular CO and CO2), albeit at a lower level than before. The maximum extent of the coma observed around Hale-Bopp when it was near the Earth and the Sun in early 1997, was 2-3 million km, or only a few times more than now; the uncertainty arises from the different observational methods used. Comae of other comets rarely ever become larger than a few hundred thousand kilometres. There is little doubt that the exceptional dimensions of the coma around Hale-Bopp is a direct consequence of its unusually large nucleus. Although it never became possible to measure its size accurately, a variety of observational methods points towards a diameter in the 40 - 70 km range. The nuclei of most other comets are at most a few km across. With its larger surface, more material is released -- this provides a natural explanation of the unusual coma of Hale-Bopp. Some years from now, this nucleus will be completely frozen. Then no more material will escape from the surface and the cloud will gradually disappear. It should then become possible, for the first time, to observe the "naked" nucleus of Hale-Bopp with large telescopes like the NTT and the Very Large Telescope (VLT) at Paranal. Note:  It appears that the largest coma seen before at another distant comet was that observed around Comet Halley after its perihelion passage. From very long exposures obtained at La Silla in April-May 1988, the diameter of its coma was found to be almost 500,000 km at a distance of about 1,300 million km (8.5 AU) from the Sun. This is the caption to ESO PR Photos 28a-b/99. They may be reproduced, if credit is given to the European Southern Observatory.